This post features jan-u-wine's new poem, At the Last. 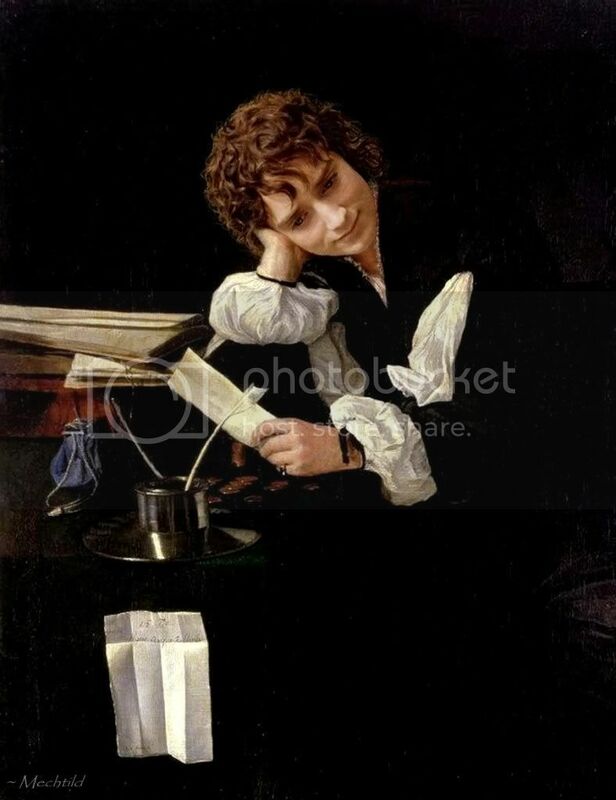 It was written back in December, inspired by a manip made from a self-portrait by 17th-century Flemish painter, Michael Sweerts. Jan's beautiful, bitterweet poem follows the the manip. Michael Sweerts was born in 1618 in Brussels, Belgium. By the age of twenty-eight, he was living in Rome and a member of the painters' academy there. Almost all of Sweerts's paintings date form his time in Rome. He painted religious and secular works, but is most noted for his life-like portraits. At thirty-eight, or by 1656, he returned to Brussels, where he founded an academy of drawing and joined the painters' guild. "Once returned from Italy, his work took on the influence of Vermeer, and his best paintings fully reveal the cool palette and classical simplification of forms hinted at in his earlier work," says the writer of the Artchive's entry. The self-portrait used for this manip is dated 1656, the year of his return. Sweerts, a Catholic, became a lay brother in 1661, then travelled to Syria and Persia as a missionary. However, he had a number of disagreements with the brothers and was dismissed after two years. Nonetheless, he remained in the east and continued to paint. He ended up in Goa, India, where he died in 1664. He was only forty-six. A bit more on Sweerts can be found at the Artchive website, here, and at the Getty Museum's site, here. These were my sources. The Manip: "Frodo Thinks Upon Elanor the Fair". When I read "At the Last", I loved it, wanted to post it, and wanted my manip to complement it. In the poem, Frodo is writing his last entry in the Red Book, internally shifting gears, turning away from the person he has been and the Shire he has known, towards the person he might yet become and the land he has not yet seen. The poem opens with Frodo hearing Elanor's voice. He muses upon the child in which he delights, but whom he must leave. It is that moment I mean to illustrate. To convey Frodo's opening mood, I chose a face from a cap from the FOTR cart scene with Gandalf. 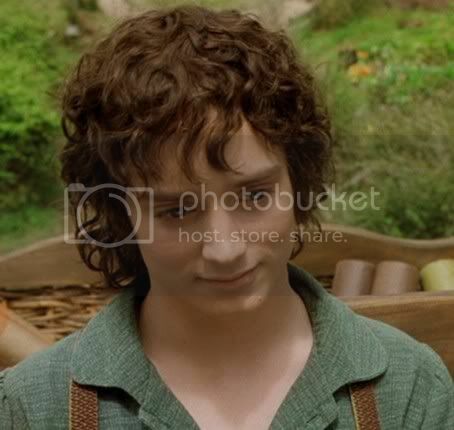 In the selected frame, Frodo's face has a hint of a smile, but there is also an element of wistfulness, even sadness. I wanted this for the manip. 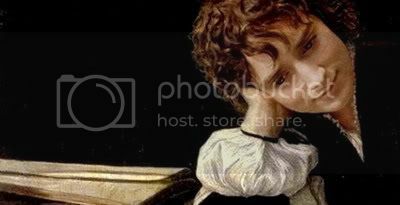 And although it was not intentional, in matching the hues and lighting of the screencap to that in Sweerts's painting, the area beneath Frodo's eyes took on a reddened look. 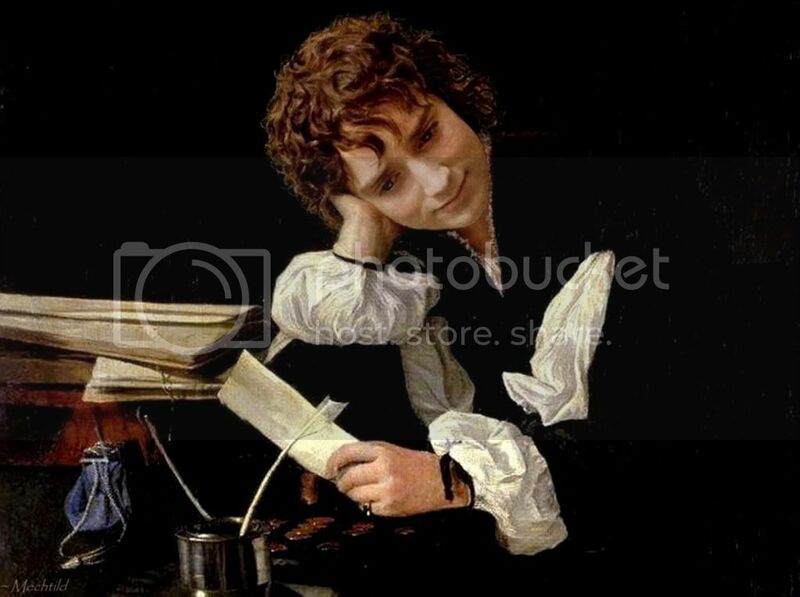 I thought this worked well for the manip, suggesting a Frodo who, knowing the time has grown short, has been staying up night after night, working and writing and, perhaps, weeping. Source for Frodo's face: cart scene with Gandalf in Fellowship. To make this piece, the primary challenge was to nuance into the painting a face and head held in a different manner from the original. Hand-work was necessary around the neck and collar, to accommodate the difference in pose. I also flipped the cap. My first draft used the original orientation. But flipping it, which changed the direction of Frodo's gaze, also changed the mood of the painting. Somehow it increased the sense of sad-smiling, musing contemplation that I was after. Also, as usual, I worked with the exposure, contrast and colour to get a better match between elements, as well as using layers of "eggshell crackle" to get a better match in surface texture for the imported face. Finally, I hand-painted in a lot of strands of hair, to better transition the imported head into its background. "Frodo Muses Upon Elanor the Fair" ~ full image. "Frodo Muses Upon Elanor the Fair" ~ cropped enlargement. ~ Aelbert Jacobsz Cuyp's 'Landscape With Cattle', plus jan-u-wine’s “The Road Back”, 1/14/10. ~ Frodo Art Travesty LJ entries (manip presentations). ~ Album of all Frodo Art Travesties (images only—be sure to enlarge images after opening). You did a great job with that manip. Oh my, this is one of Jan's most beautiful and poignant poems. Thanks for reading and viewing, Shirebound. :) The poem really is splendid. And it demonstrates Jan's particular talents well. Just wonderful. Jan's gently reflective Frodo is perfectly matched by your pic. There's a sense of relief mixed with the sadness as he does these things for the last time. Lovely. The manip is incredibly gorgeous. I stared at it for ages (it seems) and it made me think. Jan's poem. It hurts so beautifully, so very very moving. It was hard to stop weeping. It's how I always see Frodo - a little bit lost, sad but relieved. An ending can also be a new start and he's hoping for his little peace of heaven, isn't he? Thank you so much, my dear friends, for this wonderful post. It simply made my day. "It's how I always see Frodo - a little bit lost, sad but relieved. An ending can also be a new start and he's hoping for his little peace of heaven, isn't he?" Ah, yes. Thanks for stopping in, Julchen, especially when you are so pressed for time. If you get the chance, check out the link (under the poem in this entry) for "Previous manip and poem". Jan did another splendid job there, portraying post-Quest but coping Frodo walking around the Shire one day, taking in its beauties. thank you so much, dear. It was so kind of you to comment when you've got so much on your plate. This is such a beautiful manip, Mechling. I do love pensive Frodo. Didn't it make a lovely painting of Frodo? I love his wistfulness.